Full Audio – movie, new Enderverse material, a possible TV show and more! 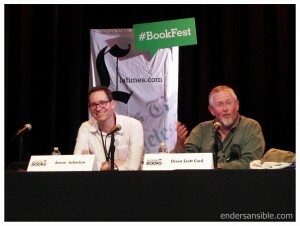 On the weekend of April 20, 2013 we had the privilege to attend a conversation between Orson Scott Card and Aaron Johnston at the Los Angeles Festival of Books. When Card and Johnston entered the auditorium there was a loud excitement from the crowd of about 250. After Orson Scott Card took time to introduce Aaron Johnston, Johnston began to ask Card questions that the audience was previously asked to submit. Card spoke about the possibility of an ‘Ender’s Game’ movie sequel, what fans can expect of book to film changes, his time on the movie set, upcoming Enderverse stories, a possible Enderverse TV show, and what happens to the Enderverse when he dies. He also described why the film has failed to be made so many times and what makes this time different. He also blatantly told fans that there will be many book to film changes. He also calls the changes necessary. He really thinks fans will enjoy the movie despite the changes. He also begged fans to see the ‘Ender’s Game’ movie so that other more filmable works of his might be made into movies. Card talked about his visit to the movie set and his small voice over role. He went on to say how he got to say his cue from just off stage, rather than a sound studio. At this point he began to fangirl over Harrison Ford. He went on to explain how Harrison Ford mentored Asa. Aaron Johnston also spoke about his role as an officer in the movie. Apart from the movie chatter, there were three very importance pieces of information revealed with regard to the Enderverse. Edit: Aaron Johnston has told us that even though he and Card have developed most of the story for the Second Formic War, there is not yet an official contract for more novels and/or comics. More information to come at a later date. Secondly, Card noted that they’re trying to develop a television series or movie based on the Formic Wars. He said that he sold the rights to Mazer Rackham, so Mazer Rackham’s character would have to undergo a name change. Finally, Card shared that in the event that he dies, Aaron Johnston will finish writing any books remaining under contract to relieve Card’s wife of any debt from unwritten books. Later in the interview Card said that he doesn’t care what happens to the rest of his books after he dies. Listen to the entire hilarious conversation between Orson Scott Card and Aaron Johnston below. Please “like” us on Facebook if you enjoyed this article so we can share more book and movie news with you. Please do not use this audio without permission. [A 12:45] – We accidently stopped recording so less than 10 seconds of audio is missing here, sorry! [B 09:30] – Was the ‘Ender’s Game’ novel intended for young adults? [B 13:20] – What is your writing process? [B 20:30] – How do you determine when you’re ready to write? [C 00:00] – What authors have influenced you? [C 04:20] – How did you get the idea to write ‘Ender’s Game’? [C 08:50] – What about Bean and the Shadow Series? [C 14:00] – How do you balance all the other responsibilities in your life? [C 16:05] – What is your advice for aspiring writers? Click here to see ‘Ender’s Game’ pictures from the LA Festival of Books.